The Market is Segmented by Type (Mobile Crane, Fixed Crane, and Marine and Off-shore Crane), Application Type (Construction, Mining and Excavation, Marine and Offshore, Industrial Applications, and Other Applications) and Geography. 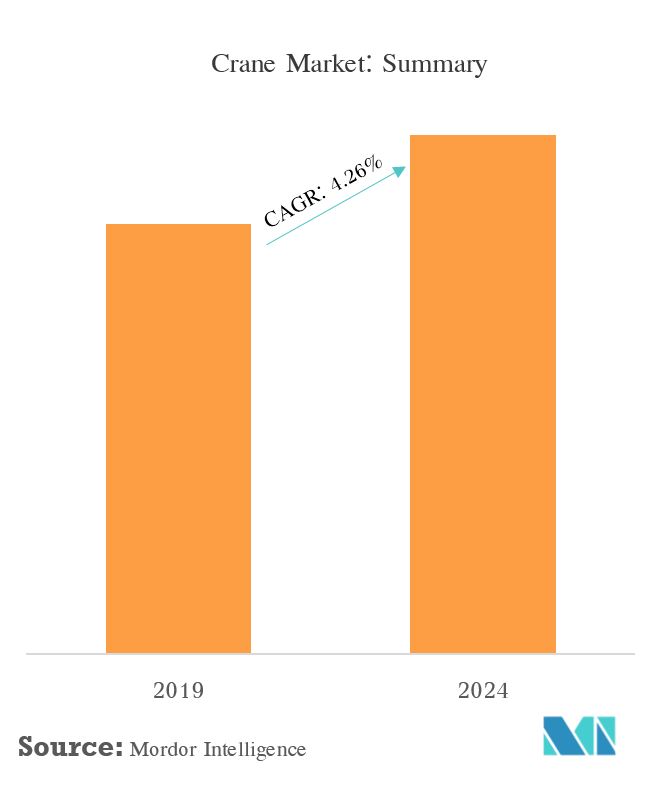 The global crane market was valued at USD 31.15 billion in 2018 and is expected to register a CAGR of about 4.26% during the forecast period (2019 – 2024). Some of the major factors driving the growth of the market are a rise in new construction and renovation activities, and an increase in investments by the mining sector in construction equipment, across the world. However, an increase in the demand for rental cranes may hinder the growth and demand for new cranes. But, enactment of stringent emission norms is expected to create demand for new cranes that comply with the new regulations. 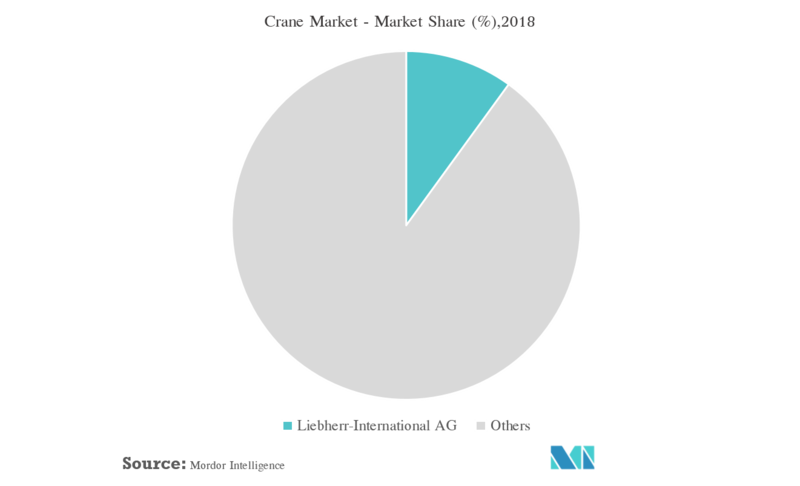 The overall situation of the crane market has shown signs of development, owing to the growth in the number of mega construction projects in Europe and the Asia-Pacific region. The Belt and Road initiative led by China, which involves the construction of ports, roads, railways, airports, and energy projects, is expected to significantly drive the demand for cranes. A crane is a machine, generally equipped with a hoist rope, chains, and/or sheaves, which are used for either lifting or lowering materials, and to move the materials horizontally. They are mainly used for lifting heavy loads and transporting them to other places. The crane market has been segmented by type and application. The global construction industry is expected to witness significant growth in the coming years, with the good opportunities in infrastructure, residential, and non-residential sectors. Some of the major factors driving the market are increasing construction of multi-family houses (with the growing trend of nuclear families); and increasing investments in construction of roads, highways, smart cities, metros, bridges, and expressways due to growing population and urbanization. Asia-Pacific region is expected to be a major market propelling the global construction industry, with augmenting construction activities in countries such as India and ASEAN countries (including Thailand, Singapore, Vietnam, and others). For instance, in India, the construction sector is one of the booming industries. The construction sector in the country is expected to grow twice as fast as China’s till 2030, with the country’s populations. The infrastructure sector is an important pillar for the growth of the Indian economy. The government is taking various initiatives to ensure time-bound creation of excellent infrastructure in the country. Additionally, in China, the demand for cranes are increasing owing to the ongoing One Belt One Road initiative. The initiative which will aid in infrastructural development such as railways, buildings, and energy projects (China, North-East Asia, Southeast Asia, South Asia, Central Asia, and West Asia) stretching from China’s western regions to Europe. The US government is also expected to increase its infrastructure spending by over USD 1 trillion in the next 10 years, with an aim to create more jobs in the country. 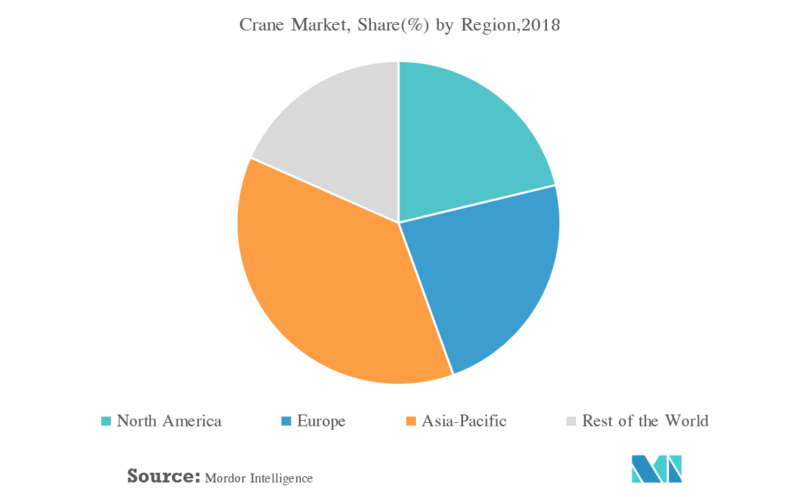 In 2018, Asia-Pacific dominated the global market. In Asia-Pacific, China dominated the market and accounted for more than 50% of the market, followed by India. 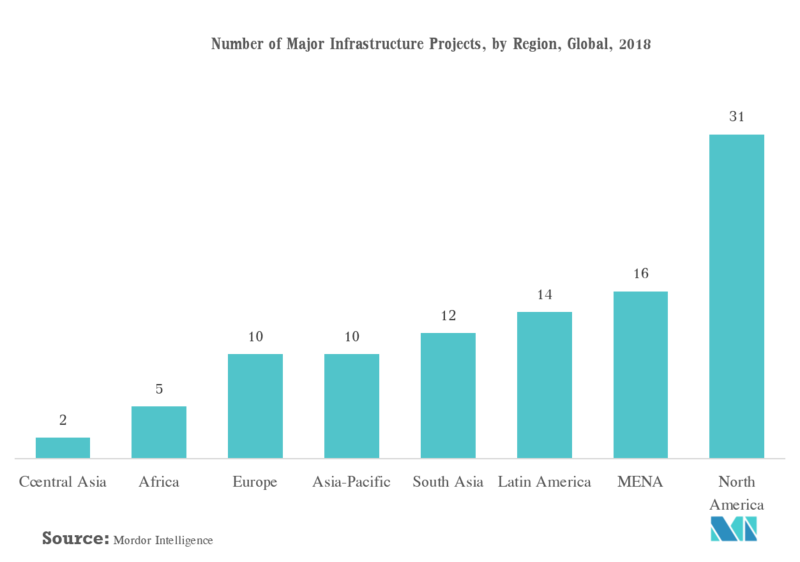 The Asia-Pacific region is the fastest-growing infrastructure market and is being driven by increasing government spending on infrastructure projects and overall construction sector in both China and India, as the construction sector is considered one of the major factor in boosting the economic growth and aids in creating jobs. China is also of the largest manufacturer of cranes. After witnessing slow growth in the construction sector in 2018, the country is expected to witness slight growth in the construction sector in 2019. The prime reason being the rise in railway construction projects. For instance, in 2018, the China Railway Corp. (CRC) announced the plans to construct 6,800 km of new railway lines including 3,200 km of high-speed rail which represents a 40% increase of new tracks. The government has also approved the construction or urban and inter-city rail projects worth USD 127.26 billion (CNY 860 billion) in several cities including Shanghai and Wuhan. In India, the construction sector is expected to witness fast growth, owing to a huge pipeline of infrastructure projects such as railways, urban infrastructure, ports, and airport segments. Apart from the aforementioned, railway stations development, increasing metro lines, and the bullet train project is expected to offer numerous opportunities for both construction companies and crane manufacturers and providers. Additionally, the growing trend of using precast construction techniques in real estate and metros is gaining momentum, which is driving the demand for tower cranes in the 10-20 metric ton range. The global crane market is dominated by a few major players. These players have successfully capitalized on the significant demand for reliable cranes, from key players in the construction, mining, and industrial sectors. In terms of tier-2 and tier-3 supply chains and supplying to small- and medium-sized applications, the market studied is fairly fragmented, with the presence of regional players. Some of the leading players in the market studied are Manitowoc, Tadano, Kobelco, Cargotec, Kone Cranes, Liebherr, Palfinger, and XCMG. 6.3.9 Zoomlion Heavy Industry Science and Technology Co. Ltd.
6.3.11 Hitachi Sumitomo Heavy Industries Construction Cranes Co. Ltd.